The Water and Environment Sector consists of two sub-sectors: the Water & Sanitation (WSS) sub-sector and the Environment & Natural Resources (ENR) sub-sector. The Water and Sanitation Sub-Sector comprises of Water Development, Water Resources Management, Rural Water Supply and Sanitation, Urban Water Supply and Sanitation, and Water for Production. The Environment and the Natural Resources Sub-Sector comprises Environmental Management; management of forests and trees; management of Wetlands and aquatic resources; and Meteorology; Weather and Climate Change. 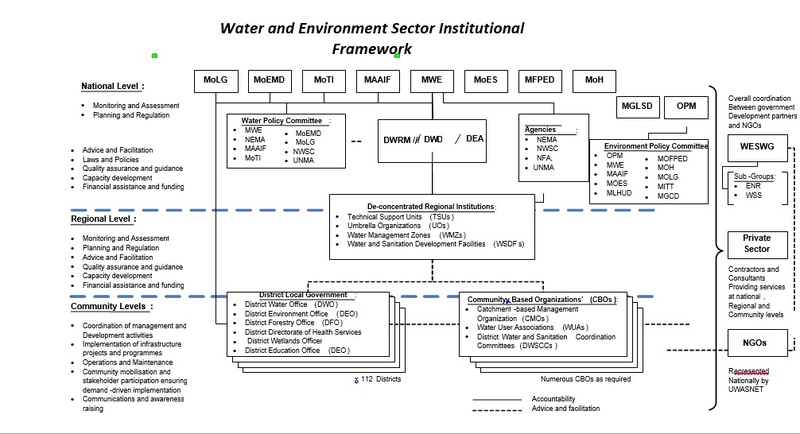 With effect from July 2008, the Water and Sanitation Sector Working Group (WSSWG)was merged with the Environment and Natural Resources Working Group (ENRWG) to form the Water and Environment Sector Working Group (WESWG). The WESWG provides policy and technical guidance for the sector. It comprises representatives from all key sector institutions (Government, Development Partners and NGOs).